After each led USA teams to perfect, 7-0 records and impressive, gold medal performances at the 2015 FIBA U19 World Championships for Men and Women, USA Basketball U19 head coaches Sean Miller (University of Arizona) and Dawn Staley (University of South Carolina) today were named co-recipients of the 2015 USA Basketball National Coach of the Year Award. In addition to their performances in 2015, both coaches have suited up for USA Basketball as players, including a gold medal for Miller at the 1991 World University Games and a total of nine gold medals for Staley. Having also been named as the USA Basketball Female Athlete of the Year in 1994 and 2004, Staley becomes the first person to have earned both a USA Basketball Coach and Athlete of the Year award. “Sean Miller and Dawn Staley were tremendous leaders for USA Basketball this past summer at the FIBA U19 World Championships,” said Jim Tooley, USA Basketball CEO/Executive Director. “We are grateful for their commitment and appreciative of the sacrifices they made in order to lead these teams to gold medals. “Sean led a young USA U19 team to incredible performances throughout the tournament, especially defensively, and the team’s quality of character was obvious in its thrilling, overtime win in the gold medal game. Led by Miller, the 2015 USA Basketball Men’s U19 World Championship Team won its seven games by an average of 25.3 points per contest at the 2015 FIBA U19 World Championship from June 27-July 5 in Crete, Greece. The gold medal finish was the USA men’s third in the past four U19 World Championships. With Staley at the helm, the 2015 USA Basketball Women’s U19 World Championship Team won its seven games by an average margin of victory of 32.1 ppg. from July 18-26 in Chekhov, Russia. The gold medal was the U.S. women’s sixth-straight U19 title. 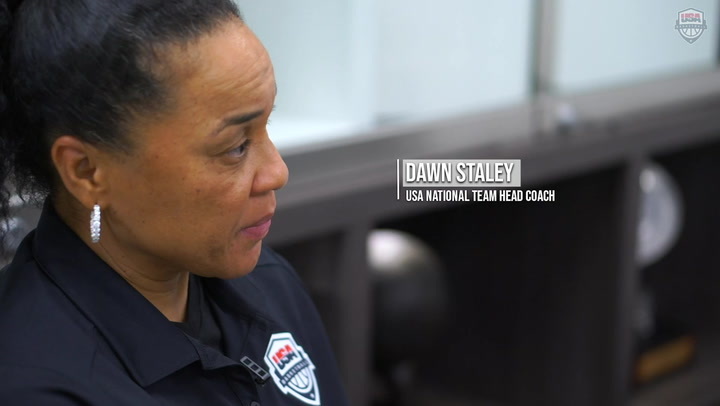 Staley also was on hand as an assistant coach for the 2015 USA Basketball Women’s National Team minicamp May 4-6 in Las Vegas and four WNT exhibition wins during a European tour and training camp Oct. 2-10 in Spain, Italy and the Czech Republic. 2015 marks the 20th time USA Basketball has presented its National Coach of the Year award, which was first earned by USA Basketball Women's National Team and Olympic head coach Tara VanDerveer in 1996. The USA Basketball National Coach of the Year Award is given to a USA Basketball head coach who made a significant impact on the success of individual athlete and team performance at the highest levels of competition in a manner consistent with the highest ethical, professional and moral standards. In the preliminary round of the 2015 FIBA U19 World Championship for Men, Miller directed the USA to wins over Iran 83-53, Croatia 103-81 and Egypt 92-50. The USA downed Argentina 93-45 in the round of 16, Italy 86-65 in the quarterfinals, host Greece 82-76 in the semifinals and Croatia 79-71 in overtime in the gold medal game. U.S. guard Jalen Brunson (Villanova/Lincolnshire, Ill.) was named the championship MVP after he averaged 14.0 points, 3.3 rebounds and a U.S. men’s U19 record 5.6 assists per game. Brunson also was the tournament’s top free throw shooter at 85.2 percent. Forward Harry Giles (Oak Hill Academy/Winston-Salem, N.C.), who averaged 14.0 ppg. and 10.6 rpg., joined Brunson on the five-member all-tournament team. “One thing that made him a great coach is that he was willing to let the players be themselves,” Brunson said of Miller. “He had his offensive set and style of play. But at the same time he let us go and trusted us. We just played hard for him. The USA’s average of 19.1 assists per game set a USA men’s U19 competition record, and its 55.6 percent shooting from 3-point (5-9 3pt FGs) against Italy on July 3 set a U.S. single-game high. Additionally, Chinanu Onauku’s (Louisville/Lanham, Md.) four blocks against Croatia on July 5 tied the USA U19 single-game record. The USA led the 16-team field in seven team statistical categories, including scoring margin, points per game (88.3), total points (618), field goal percentage (.486), blocks per game (6.4), steals per game (13.0) and efficiency (107.9). The team also featured: Justin Bibbs (Virginia Tech/Dayton, Ohio); Juwan Evans (Oklahoma State/Dallas, Texas); Terrance Ferguson (Advanced Prep International/Dallas, Texas); Josh Jackson (Prolific Prep, Calif./Southfield, Mich.); L.J. Peak (Georgetown/Gaffney, S.C.); Caleb Swanigan (Purdue/Fort Wayne, Ind. ); Jayson Tatum (Chaminade College Prep/St. Louis Mo. 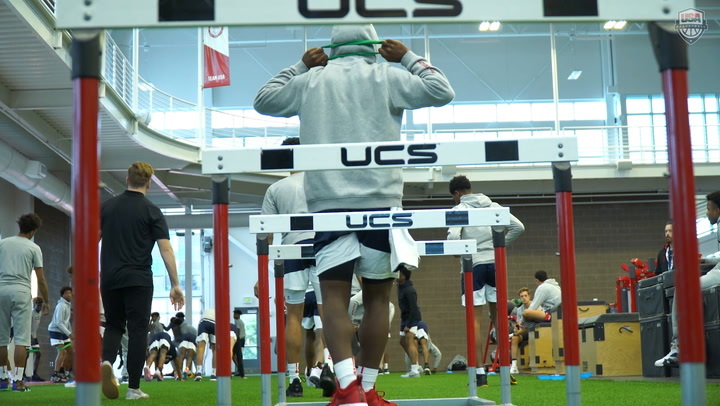 ); Allonzo Trier (Arizona/Seattle, Wash.); Thomas Welsh (UCLA/Redondo Beach, Calif.); and assistant coaches Ed Cooley (Providence) and Archie Miller (Dayton). Prior to the start of the FIBA U19 World Championship, Miller and the USA squad tallied two exhibition victories in Crete, including a 90-82 win over Greece on June 23 and an 86-75 win over Argentina on June 24. 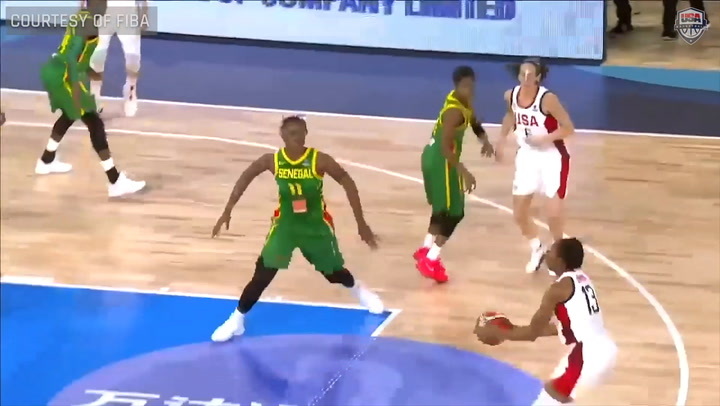 Led by Staley at the 2015 FIBA U19 World Championship for Women, the USA beat Spain 72-57, China 88-62 and Egypt 104-41 in the preliminary round. The USA downed Argentina 89-39 in the round of 16, Canada 93-45 in the quarterfinals, Spain 80-65 in the semifinals and host Russia 78-70 in a hard-fought gold medal game. U.S. forward A’ja Wilson (South Carolina/Hopkins, S.C.), who scored a USA U19 single-game record 30 points against Russia in the final, averaged a USA U19 record 18.3 ppg. and was named MVP of the tournament. She also set a single-game record for field goals attempted (21), tied the mark for field goals made (11) against Russia and became just the fourth USA athlete to participate in and claim two FIBA U19 World Championship gold medals after also winning gold in 2013. Forward Napheesa Collier (Connecticut/O’Fallon, Mo. ), who added 12.7 ppg., 9.3 rpg., 2.4 spg. and 2.0 apg., also was named to the five-member all-tournament team. The U.S. women led the 16-team field in points per game (86.3), scoring margin (+32.1), field goal percentage (.439), rebounding margin (+21.6) and assists (20.1). The team tied the USA women’s U19 single-game record with nine blocked shots against Egypt on July 21. The 2015 USA U19 Women’s World Championship Team also featured: Kristine Anigwe (California/Phoenix, Ariz.); Lauren Cox (Flower Mound H.S./Flower Mound, Texas); Crystal Dangerfield (Blackman H.S./Murfreesboro, Tenn.); Mariya Moore (Louisville/Richmond, Calif.); Gabbi Ortiz (Oklahoma/Racine, Wis.); Ali Patberg (Notre Dame/Columbus, Ind. ); Destiny Slocum (Mountain View H.S./Meridian, Idaho); Azurá Stevens (Duke/Raleigh, N.C.); Shakayla Thomas (Florida State/Sulacauga, Ala.); Chatrice White (Illinois/Shelby, Neb. ); and assistant coaches Kim Barnes Arico (Michigan) and Jeff Walz (Louisville). Prior to the U19 worlds, Staley guided the USA to a 3-0 exhibition record in the Spain U19 International Tournament in Murcia, Spain, including an 85-82 win over Australia on July 12, a 95-40 win over Canada on July 13 and a 75-51 victory against host Spain on July 14. Returning for her USA duties for the 2015 USA Women’s National Team European Tour, Staley was on hand as the USA beat Uni Girona 84-52 on Oct. 4 in Girona, Spain; the Italian National Team 79-66 on Oct. 7 in Rome, Italy; Dike Naples 86-50 on Oct. 8 in Naples, Italy; and USK Prague 85-53 on Oct. 10 in Prague, Czech Republic.